What Is Polydextrose? How Does It Improve Health & Reduce Appetite? Fiber intake has many benefits for your entire body. Insoluble fiber acts like a broom to sweep up your digestive tract, while soluble fiber has been traditionally used as a bulking agent and to help with constipation. However, many soluble fibers also act as prebiotics; that is, as a substance to feed the bacteria in our large intestine. Some fibers, like raw potato starch, tend not to discriminate very much about which kind of bacteria they feed. However, some prebiotic fibers, like polydextrose that I am going to talk about here, do tend to have a pattern of which bacteria they feed. This is important because having the “right” kinds of bacteria in your intestines has been linked to low body fat levels, lower levels of inflammation, and a more properly regulated immune system. Probiotics are one way to introduce beneficial bacteria into your intestines, but sometimes the probiotics are ineffective in actually getting the bacteria to your colon unharmed by the acid in your stomach. Also some are ineffective on their own in getting the bacteria to actually thrive and multiply there. This is where prebiotics come into the picture. The bacteria that you are giving yourself with the probiotic pills need to feed on the prebiotics to thrive. Polydextrose is a particular newer type of prebiotic fiber that your digestive system is unable to digest, so it keeps going down until it reaches your intestines. Because of its highly branched structure, it takes a while for the bacteria in your intestines to break it apart completely, and thus it is able to reach very low into your large intestine where you really want the good bacteria to grow. Some other prebiotics with a simpler structure do not always make it that low in your gastrointestinal tract. Once it reaches your large intestine, research has shown that it will specifically feed the “good” bacteria. These strains of bacteria are labeled as “good” because they have been correlated with improved gastrointestinal function (including helping to prevent inflammatory bowel disease (Witaicenis et. al., 2010)), lowered inflammation, and a lean body composition. Not only that, but if you are looking for a low calorie food, polydextrose only has a caloric value of around 1 calorie per gram. Most carbohydrates have a caloric value of 4 calories per gram (Auerbach et. al., 2007). Now, just because something is correlated with something else doesn’t mean that by doing one thing it will cause the other. In other words, correlation does not equal causation. One study showed in 2009 that 9g of polydextrose per day was able to shorten the digestive transit time and improve stool consistency in healthy subjects, which helps to improve constipation (Hengst et. al., 2009). Polydextrose helps to slow down the absorption of glucose, allowing for less of a glucose and insulin spike. When 12g of polydextrose is taken alongside 50g of pure glucose, the glycemic index drops to 89% (when taking 50g of glucose along, the glycemic index is 100%) (Jie et. al., 2000). 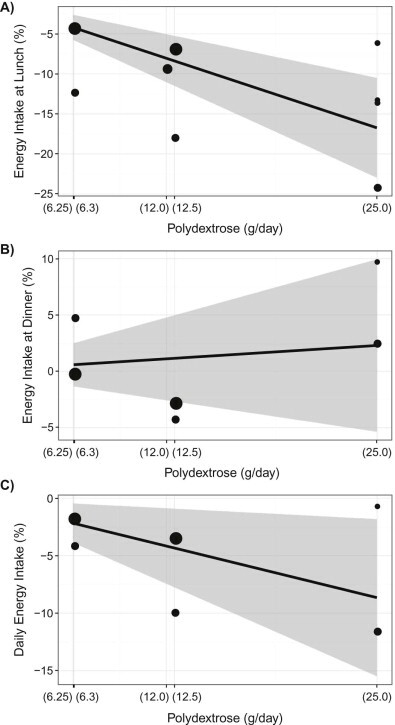 Moreover, replacing existing carbohydrates in the diet with polydextrose not only suppresses hunger, but also significantly increases 24 hour fatty acid oxidation (Konings et. al., 2014). However, this is likely at least partly due to the decrease in carbohydrate intake. Incorporating polydextrose into your daily regimen tends to significantly increase the proportion of lactobacilli and bifidobacteria and decrease some pathogenic bacteria. In one study the amount of measured bifidobacteria went up 10 fold with 12 g of polydextrose a day (Jie et. al., 2000)! Having the “right” or “wrong” kind of bacteria has been implicated in many diseases, including obesity. However, the research in this field is very new and we only have general trends at this point. This last part is particularly important because short chain fatty acids produced in the large intestine have been shown to have anti-inflammatory, antitumorigenic, and antimicrobial effects (Tan et al., 2014). This is very relevant nowadays since many people are eating a high meat diet, which can increase the risk for colorectal cancer (indeed, colorectal cancer is the third leading cause of cancer mortality in the world (Jemal et al., 2011)). Butyrate, one of these short chain fatty acids produced from polydextrose and other fibers, has already been shown to inhibit cancer cell proliferation and induce cell death in colorectal cancer cells (Sebasti�n et al., 2014). Finally, short chain fatty acids have been shown to directly bind to receptors that increase sympathetic activity throughout the body (Kimura et al., 2011). This means that consuming more polydextrose and other soluble fibers will likely make it easier to increase your daily energy expenditure through extra movement. Polydextrose can be found at some drug stores and supermarkets now. Usually they are in the newer “fiber gummies”. Polydextrose can also be bought as a powder that you can add to any drink or baking recipe! If you think you should increase your fiber intake, then polydextrose is certainly one kind you should try – at least you know you won’t get gas or get bloated like you might with some other fibers!